Years and years ago, back when Yahoo!360 was still a thing, I made this graphic as part of a community challenge (Not So Secret Secrets). It still pretty much sums up some of my "spirituality", if you will. I'm sitting here today, with my Christmas tree and my candles, what my daughter describes as my "altar of Ganesha", and my ritual tea (which has replaced my ritual cola when writing). While I gave up cola and the belief that Jesus died as some sort of payment for my past and future unspecified evils, I never gave up on a more secular side of Christmas. Because, when it comes right down to it, I do love my rituals. In many ways, I've evolved as an atheist. 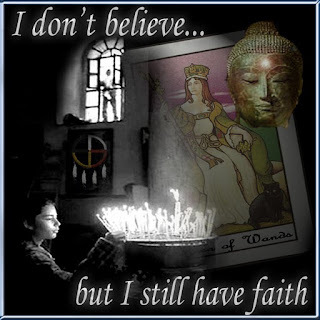 I still believe that religion is expression of cultural schema that defies other language (at least for the time being)... and I absolutely don't believe in any conscious puppeteer or overlord or magic parent. But while I don't miss having a god or goddess, I DO miss the ritual. Ritual is comforting, and we all have some sort of little rituals that make our days somehow easier. I like to think of them as social/emotional shortcuts and/or anchors. The celebration of Christmas for me is one fraught with both deep introspection and a sense of deep connectedness. Stemming from the idea of "advent" or, in the Orthodox Church "Little Lent", the days leading up to Christmas for me are a time of examining my connections to my family and friends. In many cases, for me these connections are symbolized by the exchange of material objects that fulfill a need or symbolize a relationship. While it sounds commercial, gifts are a very VERY important aspect of this holiday season for that reason: to me they are a tangible way to say (as the Na'vi would say in the movie Avatar) "I SEE you." or, if your old school sci fi (like I am) "I grok you" (without the cannibalistic overtones). Easter ritual, or Lenten ritual is more difficult for me, because I associate it so closely with the death to life cycle of spring... rebirth... and I generally (and often subconsciously) start stripping down my life for minute examination and realize it's somewhere around Ash Wednesday in the Roman Church. While I'm not preparing for the Resurrection of Christ in any literal way, I am preparing for my own resurrection, or the coming of spring and new growth, or some such thing. As an atheist, I still find it useful to use religious language, symbols and rituals as maps for non-theistic aspects of my life, to give focus to certain thoughts and states of mind (why I have images of Ganesha and The Goddess) and to open up new ways to look at things I may be stuck with (tarot). I also find that the metaphors and allegories of religion to be more accurate to describe certain emotional and social values than the language of science. Not that they are TRUER in a literal sense, but that they are more efficient in relating the relevant information. For me, personally, this sets up a somewhat embarrassing dichotomy, because I realize that there is no "spirit" or "god" or "magic", yet I've got images, light candles, and go to a church. Recently I read some writing by local Atheopagan, Mark Green, which refers to the practice aspect of religion as "deep play", something that seems both on point, and (for me) repulsive. Perhaps I have not evolved to the point yet where I can consciously accept that I can (and do) participate in practices I don't BELIEVE in, yet have some sort of faith in. Perhaps I should light my candles in front of my statues of Ganesha, and reflect on how to remove that particular obstacle in my life.